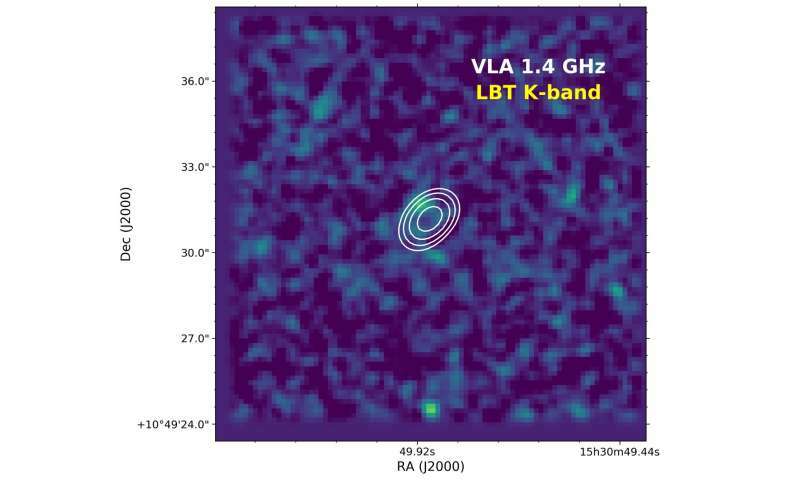 After nearly 20 years, the record of the most distant radio galaxy ever discovered has been broken. A team led by Ph.D. student Aayush Saxena (Leiden Observatory, the Netherlands) has found a radio galaxy from a time when the universe was only 7 percent of its current age, at a distance of 12 billion light-years. The team used the Giant Meter-wave Radio Telescope (GMRT) in India to initially identify the radio galaxy. The distance to this galaxy was then determined using the Gemini North telescope in Hawaii and the Large Binocular Telescope in Arizona by measuring the redshift of the galaxy. The redshift of z = 5.72 means that the galaxy is perceived as it looked when the universe was only a billion years old. This also means that the light from this galaxy is almost 12 billion years old. The team consists of astronomers from the Netherlands, Brazil, the United Kingdom and Italy. The study announcing these results has been accepted for publication in the Monthly Notices of the Royal Astronomical Society. Measuring the redshift of a galaxy tells astronomers its distance. The farther away galaxies are, the faster they move away from us. The light from these galaxies therefore appears to be redder, following an effect that is known as the Doppler shift. Therefore, the higher the speed at which a galaxy moves away from us, the greater its redshift. Radio galaxies are very rare objects in the universe. They are colossal galaxies with a supermassive black hole in their center that actively accretes gas and dust from its surroundings. This activity initiates the launch of high-energy jet streams, which are capable of accelerating charged particles around the supermassive black hole to almost the speed of light. These jets are very clearly observed at radio wavelengths. The fact that such galaxies exist in the distant universe has surprised astronomers. The discovery of such galaxies at extremely large distances is important for our understanding of the formation and evolution of galaxies. Studying these radio galaxies in detail also sheds light on the formation of primordial black holes, which have driven and regulated the growth of galaxies. First author Aayush Saxena (Leiden Observatory) says, "It is very surprising how these galaxies have built up their mass in such a short period of time." Co-author Huub Röttgering (Leiden Observatory, the Netherlands) adds: "Bright radio galaxies harbor supermassive black holes. It is amazing to find such objects as early in the history of the universe; the time for these supermassive black holes to form and grow must have been very short." A radio galaxy with a redshift of z = 5.19 had been the previous record holder since its discovery in 1999. The next generation of radio telescopes, combined with the world's largest optical and infrared telescopes, will be able to detect radio galaxies at even greater redshifts. Logically, with so many contrary observations to the Huge Bang Fantasy, you might think that astronomers might get a clue that they have been dreaming all along. But no...these guys are fantasizers by nature. Otherwise, they would have chosen a different career, one where a bit more logical deduction is taught in school. Long live the Huge Bang Fantasy! The Big Bang model works. It does an incredible job mathematically describing A universe, just not OUR universe.